High dose of arginine per serving! OLIMP Argi Power is a dietary supplement with a high dose of arginine, an essential amino acid. Maintaining adequate levels of this compound brings many health benefits and also improves the effectiveness of all bodily functions. In addition, it boosts muscle pump during training, which is extremely significant for individuals working out in the gym. Arginine is a substance which belongs to o group of proteinogenic amino acids. This means that it is involved actively in protein production in the body that is a very vital factor for normal development. Apart from body-building functions, arginine regulates blood flow in the body. This effect is associated with its impact on nitrogen oxide synthesis. Along with ornithine and argininosuccinate, this amino acid participates in the nitrogen cycle. In this process, these compounds undergo metabolic processes during which NO molecule is released. Arginine is an important mediator which helps regulate the contractility of vascular smooth muscles. An increase in nitrogen oxide levels causes a series of events which lead to the relaxation of blood vessels. This contributes to the regulation of blood pressure and helps improve the supply of blood to tissues where it is involved in their nourishment, gas exchange and removal of metabolic waste products. Apart from its major impact on the metabolism of muscles and other tissues, arginine provides a strong muscle pump desired by gym visitors. Vasodilation leads to maximum muscles oxygen saturation which gives a characteristic feeling of tight muscles. This causes a temporary increase in the size of the tissue which contributes to greater microdamage. Owing to that, it is possible to maximize muscle anabolism. An increase in the supply of oxygen-rich blood ensures high performance of the body. What is more, arginine is used in the body to synthesis creatine. It is a substance with improves energy processes in cells. Since it is a carrier of high-energy phosphate groups, it leads to the formation of ADP molecules. This ensures efficient resynthesis of ATP – the main source of energy in the body. A positive effect on blood circulation is also extremely important for individuals with hypertension and type II diabetes. Persons with these diseases are reported to have high levels of arginase. It is an enzyme which causes the breakdown of arginine. As a result, blood pressure increases, which leads in a longer term to damage to the circulatory system, kidneys and other organs. Regular arginine supplementation is a vital preventive measure for such individuals. Arginine participates in the urea cycle and that is why it neutralizes and helps remove nitrogen compounds from the body, e.g. ammonia. These are metabolic products that impair the function of the whole body in excessive amounts. Taking this amino acid contributes to an improvement in your general health and function of organs. 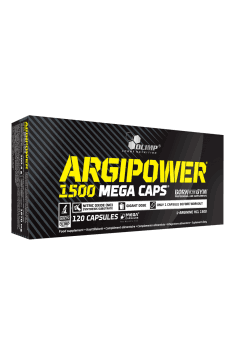 The dietary supplement OLIMP Argi Power is a formula which provides a large dose of high-quality arginine. Benefits related to its supplementation are extremely interesting for persons working out in the gym. A strong muscle pump facilitates better muscle nourishment and oxygenation and improves its regeneration. Its positive effect on blood pressure makes it suitable for individuals suffering from hypertension and type II diabetes. Anti-caking agent – magnesium salts of fatty acids, capsule (gelatin, colour: E 171). Citrulline in the form of malate. It influences muscle blood supply and achieving muscle pump. Pre-workout supplement with beta-alanine, I-tyrosine and taurine. It increases stamina and improves concentration. Amino acid supplement enriched with stimulants. It facilitates to increase muscle mass, improves endurance and focus.